Security cameras are a key component of surveillance and security systems and come in a wide range of form which are factors with a multitude of features. CCTV cameras are often used synonymously with video surveillance that started out as 100 percent analog systems but gradually become all digital over the years. CCTVs are now fully digital, network-based video surveillance systems which are using network cameras and PC servers for monitoring and recording video feeds. From the conventional analog tube cameras, which used to connect to VCRs that required hand-operated tape switching, security cameras have come a long way since then. Security systems now use DVRs and NVRs for recording videos. Both are the most common yet very unique methods of video recording. We take a look at the difference between the two to help you identify what’s best for your needs. A DVR, or a Digital Video Recorder, is a recording device that records video in a digital format and stores it in hard drives instead of video tapes. It requires video signals to be digitized and compressed in order to store as many days’ worth of video feed as possible. Security systems using DVRs play a major role in alarm verification and security assessment. The digital video images are stored on hard disks similar to those used in the PCs and have storage spaces measured in gigabytes. It provides a low-cost but efficient method for storing compressed video files. They are mainly used to record analog or coax-based cameras. A NVR, or a Network Video Recorder, is an electronic recording device that uses digital or analog cameras converted to IP cameras using a network server. The digital data is then delivered to a network in compliance with the TCP/IP transport protocol and recorded by a NVR. It’s a self-contained system that contains the computer, software, storage, and a multiport Power over Ethernet (PoE) switch in one unit. NVRs are plug-and-play devices similar to DVRs, except they are used with IP cameras instead of analog cameras. A digital video recorder (DVR) is just like a computer with a hard drive and a video encoder with coaxial ports for analog cameras. DVRs are mainly used for recording semi-digital or analog cameras or coaxial-based cameras. In technical terms, it is a recording device that records video in a digital format and stores it in hard drives instead of video tapes. 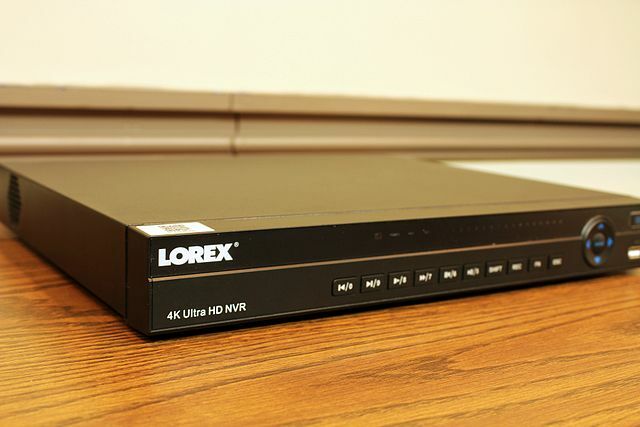 A network video recorder (NVR) is like any other network device with a static IP address assigned to it which connects to the network via Ethernet cables. In simple terms, a NVR is a recording device that records data from IP cameras wirelessly. A DVR is basically an electronic recording device designed specifically for one function, which is to take both analog and digital video input signals, digitize the analog signals, compress the signals as required, and record them onto a hard drive. A self-contained DVR has an OS that is PC-based or uses an embedded proprietary OS. A NVR is a proprietary digital hardware box with preinstalled video management software for recording video from video encoders or network cameras. It is mostly used in IP video surveillance and security systems and managed remotely over the internet. A DVR is a recording device that connects to the camera via coaxial, fiber optic, or unshielded twisted pair cabling. The two most common coax cables used in CCTV systems are RG-58 (50 Ohm) and RG-59 (75 Ohm). Most CCTV applications require 75 Ohm cable because it runs both video and power in one cable and is appropriately shielded for minimal interference. However, installation can be a little difficult because the wires run from cameras to the DVR. A single wire connects to the NVR via PoE (Power over Ethernet) which eliminates the need for excessive cables and wiring. The cameras in a CCTV system need to be in one location and because the wires always run from the cameras to the DVR which would require multiple holes to be drilled on walls to run the wires to the DVR, the installation tends out to be a little difficult and time-consuming. The cabling is easy and NVRs basically connect to the cameras wirelessly, so you don’t have to worry about running wires to the network video recorder. In addition, they are incredibly flexible and the PoE provides both power and network to the cameras via a single cable which makes the installation simple and effortless. Both DVR and NVR are recording devices used to record videos onto hard drives, except DVR is compatible with analog or semi-digital cameras, whereas NVRs are mainly used for recording videos in IP cameras. They look incredibly similar, but differ in how they use cabling to connect to cameras. DVRs record analog cameras via coaxial or UTP cabling, whereas NVRs are fully digital, network-based video surveillance systems used to record IP cameras wirelessly via Power over Ethernet (PoE) which eliminates the need for excessive cables and wiring running all over the place. However, at the end of the day, it’s all about your personal preference. NVRs are an ideal choice for those who are looking for an easy and convenient security system for their private homes or store setting. For those who do not wish to go on the higher side, DVRs are a long way to go. Sagar Khillar. 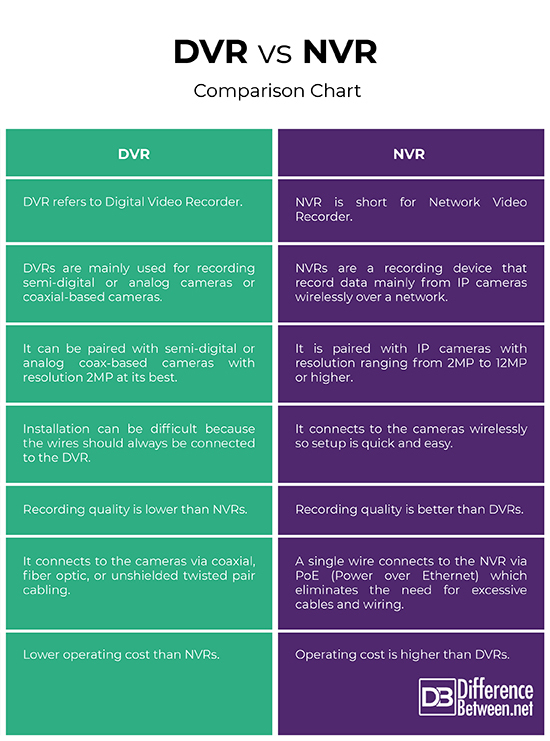 "Difference Between DVR and NVR." DifferenceBetween.net. October 12, 2018 < http://www.differencebetween.net/technology/difference-between-dvr-and-nvr/ >.